Appealing window coverings must provide privacy, practicality, and longevity. This is why we have the best quality products in shutters, blinds, shades, and window film in Detroit. Not only that, but we’ll also custom craft your shutters to perfectly fit your windows and match your taste. Browse through all the window treatment products available to you. With more than three decades of unexcelled quality and customer service, we provide superior shutters you can buy with confidence. Plantation shutters are the choice window treatment in Detroit, because they’re energy efficient, enduring, and stunning. Their large louvers are a breeze to adjust to let in as much or as little light as you desire – and look beautiful, in your home. 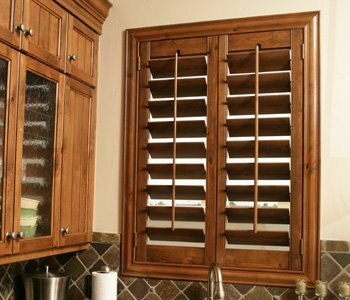 Polywood® plantation shutters are a composite shutter that gives you extra control over light, temperature, noise, and privacy. Ovation® wood shutters are durable wood plantation shutters created with furniture-grade teak. And reclaimed wood shutters are fashioned from certified upcycled wood from barns, fences, and buildings. We understand that not all windows are created equal. We’ll custom measure and fit the shutters you choose to the windows in your home. No matter what shape your windows are – circular, octagonal, sidelights on your entry door, we have a shutter for your windows that are unique or specialty-shaped. Desire shutters that match your décor? Our experienced installers and designers will help you pick from our palette of paints and stains to go with your home. Learn about your color options here. Interested in bringing the stylish feel of barn doors to your Detroit home? Sunburst Shutters Detroit guides you in finding the perfect blend of barn door paints, stains, styles, and hardware options for you. And we mount it for you as a substitute for a door or as a window treatment. Learn more about our sliding barn doors and sliding barn door shutters. For homeowners who are interested in other treatments, we offer a variety of blinds and shades to cover every window in your Detroit home in style. We invite you to browse through our blinds and shades collections that feature quality manufacturing and a wide selection of colors and styles.